Got a question for Children Of Bodom? Tell us and win some strings! 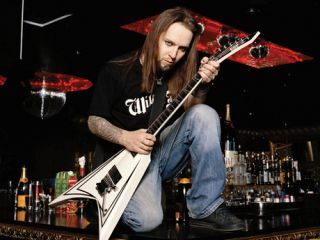 TG is interviewing the greatest metal guitarist of all time*, Children Of Bodom's Alexi Laiho and his bandmate Roope Latvala this week, and we're giving you the chance to ask them your questions. If you've got something you want to ask Alexi or Roope, just get in touch via the Total Guitar Twitter or Facebook pages or by emailing totalguitar@futurenet.com with the subject line 'Question for Bodom' and your name, location and question. Maybe you want to know who their favourite players are, what guitars or gear they can't live without, or how Alexi felt about being named greatest metal guitarist? Now's your chance to ask! Finally, remember we're a guitar mag, so although we may slip in a few general ones, if you ask a question about their guitar playing or songwriting, you're much more likely to get it answered. If we pick your question, you'll win a set of D'Adarrio guitar strings and feature in our June issue (TG215: on sale 13 May). *According to the results of our recent online poll.